– Grab some of the beer cans out of the recycling bin and experiment with making bracelets. Hopefully my shoulder won’t complain too much and I can give my metal stamps a try. – Hook up my camera to my ipad and download my latest gig photos. 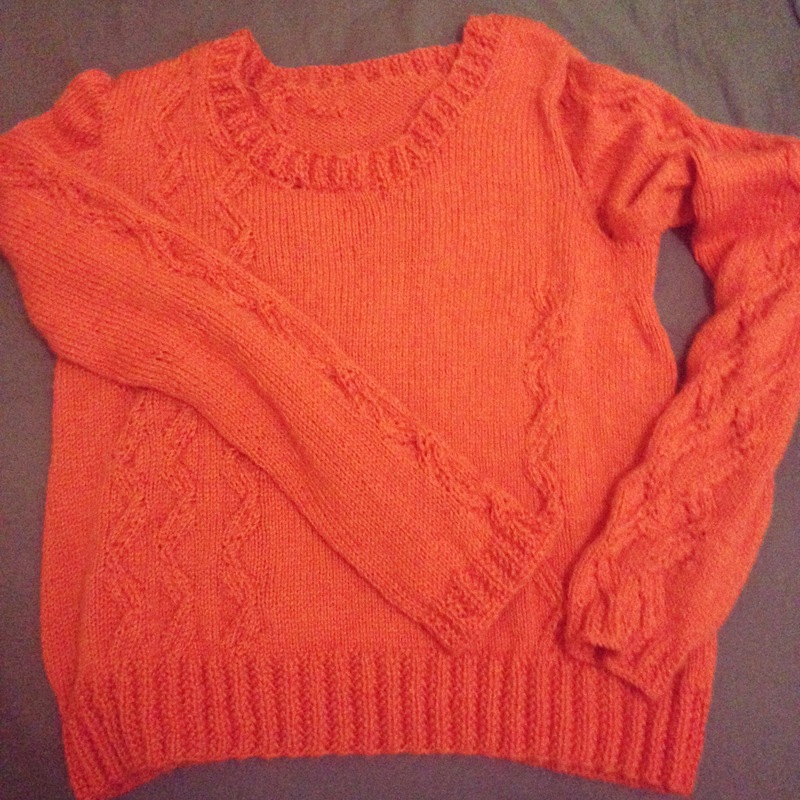 – Put the air conditioning on full blast and persuade the boyfriend to take photos of me in the knitted jumper I just finished but only tried it on for the briefest second because I don’t want to sweat all over it. This is a terrible photo of it. – Try not to just collapse on the couch and watch Grey’s Anatomy. I’ve never watched it before and have been mainlining it for the last 2 weeks and I’m now up to Season 3. What are your plans for this afternoon? I didn’t know one could make pasta in a breadmaker! That is so cool! Also, I am fascinated by the idea of making bracelets out of cans. I think that would be really fun and different! The bread maker just makes the pasta dough. They can also make jam which I will definitely try. We have so many cans that I figure that if I stuff up, then no harm done. Those sound like pretty great plans for an afternoon ^_^ Congrats on finishing a jumper, I’ve never been able to work up the courage to try knitting one! This afternoon, I’m hoping to do something creative, whether it’s baking something new or trying a different crochet pattern. And I hope there will be some puppy snuggles too! AC full blast!!!!!! I sort off dislike you a little right now. Guess what it’s doing here right now? More F-ing snow. That’s it. I’m getting on a plane and coming to you. Chill some beer. I love the jumper. The cables are a nice touch.